Are you new to coastering? Or are your kids/significant other/friends hounding you to ride roller coasters with them? However, does the prospect of boarding one of the new breed of behemoths scare the daylights out of you? If so, you've come to the right place. Park rule number one: Never coerce people (including yourself) to ride a roller coaster or other thrill ride against their will. Amusement and theme parks are supposed to be about fun, shared experiences, not lessons in intimidation and agony. Having said that, at least half the fun of thrill rides is—well, the thrill. The best roller coasters turn knuckles white and induce screams. Woody Woodpecker's Nuthouse Coaster at Universal Studios Florida. You could start with this very tame ride that is barely a notch above a kiddie coaster. The steepest drop is 20 feet and the top speed is 22 mph. Similar coasters include Goofy's Barnstormer at the Magic Kingdom in Walt Disney World, Florida, and Gadget's Go Coaster at Disneyland in California. Flight of the Hippogriff at the Wizarding World of Harry Potter in Islands of Adventure, Universal Orlando, FL. This is a typical family coaster. The biggest drop is 30 feet and the top speed is 28 mph. 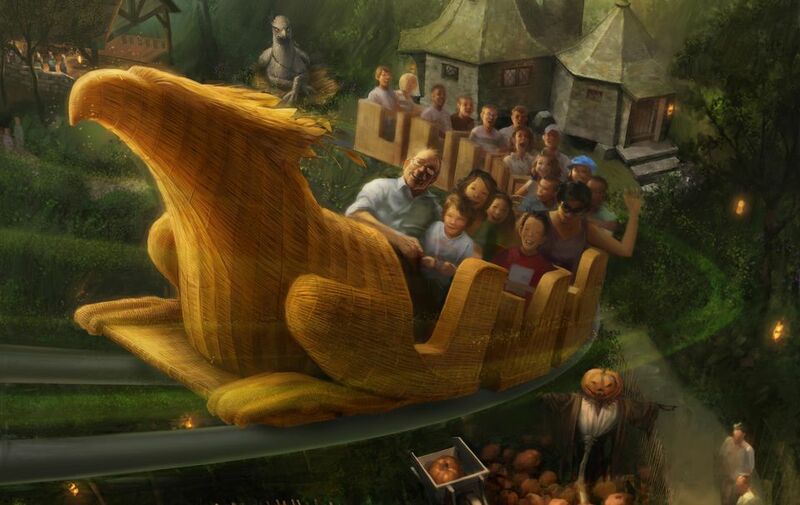 There is a similar Flight of the Hippogriff coaster at Universal Studios Hollywood. Space Mountain at Disneyland, Anaheim, CA, and the Magic Kingdom at Walt Disney World, Lake Buena Vista, FL. The special "space" effects are great, and because they are indoors and dark, the anticipation adds to the psychological drama. However, for all of the hype, the two Space Mountain rides are really just tame steel coasters that poke along at 27 mph (in Florida) and 32 mph (in California). Neither has steep drops or inversions. They mostly just twist and turn. Big Thunder Mountain Railroad at Disneyland, Anaheim, CA, and the Magic Kingdom at Walt Disney World, Lake Buena Vista, FL. If Space Mountain's darkness and fear of the unknown freaks you out, consider riding one of Disney's other mountain coasters. The outdoor mine train ride hits 28 mph (in California) and 36 mph (in Florida) Like Space Mountain, neither coaster includes any steep drops. The popular attractions have inspired similar mine train rides (minus the great Disney effects) at many other parks. Another good choice would be the original Runaway Mine Train, which opened in 1966 at Six Flags Over Texas. Matterhorn Bobsleds at Disneyland, Anaheim, CA. Another Disney mountain ride, the world's first steel tracked coaster climbs 80 feet, but does not have any steep drops and maintains relatively slow speeds. Runaway Mountain at Six Flags Over Texas, Arlington, TX. This indoor steel coaster drops 30 feet and reaches speeds up to 40 mph. Comet at Hersheypark, Hershey, PA. A great, classic wooden coaster, this ride has a 78-foot drop and reaches a top speed of 50 mph. Cobra’s Curse at Busch Gardens Tampa, FL. It hits 40 mph, but its cars spin, although not as much as other spinning coasters. After you're somewhat comfortable with intermediate coasters, check out progressively bigger ones, but save the hypercoasters and ones with wacky features (flying, magnetic launch, etc.) until you feel you are ready. You may find that inversions, such as corkscrews, loops, and other elements that turn passengers upside down, just freak you out. If that's the case, avoid coasters that include them. If you want to give inversions a try, consider tackling a coaster that only has one of them, such as New Revolution at Six Flags Magic Mountain in Valencia, CA. Once you've battled your demons, chances are you'll be hooked for life. And your kids/significant other/friends will be prying you away from roller coasters. Then again, you may find that coasters really terrify you, and you just can't kick your fears. If that's the case, you may want to learn how to visit Walt Disney World if you are a ride wimp.